Sometimes in family history research wandering down an unrelated byway reveals a story you could not have invented. Reading the Lee letters  I wondered who was the school master at Chelsea who had married an heiress? According to the letter written in November 1749 – Mr Rothery was marry’d last May to that Lady at Chelsea with 3 thousand pound fortune. A little investigation through British History Online revealed that At Turret House, Paradise Row, the parish lecturer William Rothery taught boarders and day boys including the botanist Thomas Martyn (1735-1825), who attended for ten years and remembered him as an excellent master but one who had died in 1759 ‘lost in drink’ . Indeed it is likely he is also the same William Rothery of Chelsea declared bankrupt in 1756. Chelsea was then a pleasant village lying alongside the Thames away from the hurly burly and pollution of London. The school was close to the Physic Garden which had been founded in 1673 by the Worshipful Society of Apothecaries and also to the Chelsea Royal Hospital founded under Charles II for retired servicemen, the Chelsea Pensioners. Paradise Row is now known as Royal Hospital Road and Paradise Walk which in 1750 led directly down to the banks of the Thames, is now separated from it by the Victorian houses that front onto the Chelsea Embankment, but in 1749 much of the land next to the Thames was marshy and there were extensive osier beds at Chelsea. William Rothery, baptised 18 February 1704 at St Martin in the Fields, London, and with an MA from St John’s College Cambridge, married Lydia Rooker in 1749. If the letter is correct this was in May although a Vicar General Licence was issued on 07 Feb 1749. Guessing that if they had a daughter she might be named after her mother I quickly found little Lydia Rothery in IGI, baptised at St Luke’s Chelsea in December 1752, then her older brother George baptised in February 1750. Sadly little George died and was buried in St Luke’s on the 15th of June 1752. Further online searching of the National Archive website turned up a number of documents held at the Derbyshire Record Office in Matlock relating to the Perrin family. This included the Will of William Perrin of Vere in Jamaica which left William Rothery, his brother-in-law, a legacy of £500 and named him as residuary legatee in the event that Perrin’s wife and children died. This would have made Rothery an extremely rich man as William Perrin was one of the wealthiest sugar planters in Jamaica. The Will was proved in September 1759 which meant that the legacy to William arrived too late to save him from drink and bankruptcy since he had died in June of that year. However the Will suggested to me that Frances Perrin was probably Frances Rooker before her marriage and I found they had married at St Vedast Foster Lane in London on 22 July 1738 by Vicar General Licence dated the previous day. Between 1740 and 1747 five children were born to them and baptised in Westminster, of whom only William Philp Perrin and Sarah survived to adulthood. Also mentioned in Perrin’s Will was Benjamin Victor who it turns out is still well known in the history of theatre. Born about the beginning of the eighteenth century he married Mary, another of the Rooker sisters, on 3rd July 1722 at Charterhouse Chapel, Finsbury by Faculty Office licence issued on 13 June. He began life as a barber and linen draper, but the lure of the theatre proved strong and he moved to acting in and writing plays. In October 1746 he settled with his wife in Dublin as treasurer and deputy manager of the theatre in Smock Alley under Thomas Sheridan (1719-1788). The theatre was moderately successful but closed in 1759 and Benjamin Victor returned to London alone, Mary having died two years earlier. He became Treasurer at the Theatre Royal in Drury Lane and published a history of the theatre in Dublin and London spanning over forty years that is still consulted by theatre historians today. He married again and died in Charles Street, Covent Garden, on 3 December 1778 and was buried in Bunhill Fields on the 6th. Even today he rates a lengthy entry in the Dictionary of National Biography. Boswell who met him at Thomas Sheridan’s on November 30, 1762, described him as an honest, indolent, conversable man [who] has a great many anecdotes. Searching for further information about the Rooker sisters I discovered that Jane Rooker had married Mason Victor, Benjamin’s brother, on 11 April 1730 at St James’ Clerkenwell. Mason Victor was a Cordwainer (a shoemaker and leather worker, probably employing a number of men) who died twenty-five years later apparently childless. It seems he disapproved of his siblings since in his Will proved on 26 May 1755 he left only a shilling to his brother Benjamin, a shilling to his sister Elizabeth and everything else to his wife Jane. He was probably buried in Bunhill Fields although the Victor buried at that date is not given a first name. Jane Rooker may have carried on his business in Holborn since when she died in 1787 she left small legacies to two journeymen shoemakers. She too was buried at Bunhill fields. 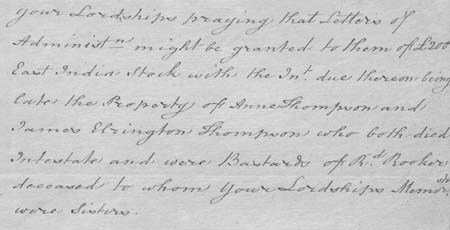 By 1759 all three surviving Rooker sisters were widows and appear to have been living most of their time in London, although Frances retained interests in Derbyshire, and of course in Jamaica as absentee involved in the management of the plantation on behalf of her son. Enter their brother Richard involved, as a witness, in one of the most horrific murders of the day. Richard had been apprenticed to their father, a noted clockmaker of the same name, and had the Freedom of the City of London in the Clockmakers Company, but the trade had evidently not suited him for by 1759 he was keeping a Grocery business in Water Lane, High Holborn and renting a room in the house of Sarah Metyard. Sarah Metyard kept a Haberdasher’s shop in Bruton Street, and with her daughter Sarah Morgan Metyard supervised a group of parish apprentices who knitted mittens and purses for sale. These children were bound to a mistress for seven years by their parish to avoid them being a charge on the poor rate, to give them a useful trade and keep them out of the workhouse. When it worked well it was a system that had merits. Among the apprentices at Bruton Street were two young sisters Ann and Mary Nailor sent there from the parish of Tottenham High Cross north of London. Ann was slow at her work and seems to have been picked on from the outset for particularly harsh treatment. Given less of the meagre food available than the other girls she was regularly beaten, by both Metyard women, with broom handles, shoes and a walking stick. When she developed a whitlow on her finger Mrs Metyard took her to have it amputated. As conditions worsened about late September 1758 little Ann tried to run away, but bumped into the milkman Jeremy Brown who brought her back. At the later trial he said She desired and pressed upon me that I would let her go, and said she should be starved if she staid there. I said, my dear, you will not be starved. She said, pray, milkman, let me go, for I have had no victuals for so long a time (the time I cannot recollect). The daughter and the mother came running down stairs, and desired I would stop her. The attempted escape led to a severe beating administered by both Metyard women and Ann was then taken upstairs and fastened with a string around her waist and her hands tied behind her back so she could neither sit nor lie down. For three days she was kept without food, only untied at night to go to bed (and once when her sister cut the string, earning a beating for it). At the end of this the other apprentices saw that Ann hung limp from the string that tied her. Sarah Morgan Metyard came and hit her with a shoe, but when she still did not move the mother called for ‘drops’ (probably sal volatile, spirits of ammonia, used to treat fainting) and the dead child was taken upstairs to the garret. The Metyards then contrived to make it look as if Ann had run away, and after keeping the body hidden in the garret for two months until the smell became impossible, Mrs Metyard cut it up and wrapping the parts in ‘bed furniture’ took them at night to the Chick Lane Gully hole. She had to make two trips from Bruton Street, a distance of over a mile. The other apprentices had no doubt Ann was dead as she had left behind all her four small shifts and her shoes, but they did not dare to say anything. The Watchmen who found and reassembled the body parts and arranged burial had no way of knowing who it was. Life went on as usual at Bruton Street until about two years later when Richard Rooker came as a lodger. He was so upset at the treatment he saw meted out to the girls that he soon moved out to Upper Hill Street, and feeling sorry for her persuaded Sarah Morgan Metyard to come away as his servant. Later he inherited a house at Ealing (probably on the death of his father) and retired there taking young Sarah with him. They were pursued there by Sarah’s mother screeching abuse, threatening her daughter and generally making life impossible until one day Rooker and his gardener heard screaming and found the mother, who had just dropped the knife she had been holding to her daughter’s throat. Curious about the references he had overheard Sarah make to the Chick Lane ghost and the gully hole, Rooker questioned his servant and the whole story came out. Believing Sarah to have been bullied into it by her mother, and wanting to deal with her once and for all, he wrote to the Magistrates at Tottenham, where Ann Nailor had come from, and in due course the mother was arrested. Her apprentices were sent to the Workhouse and some days later Sarah Morgan Metyard was also taken into custody. 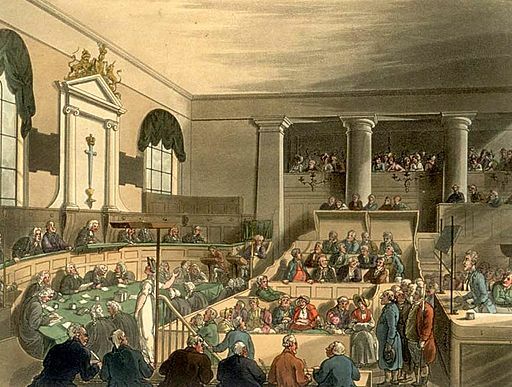 The full account of the trial and the additional information to be gleaned from the evidence of the Ordinary (Chaplain) at Newgate can be read at www.oldbaileyonline.org and in the Annual Register for 1762 (p.132 ff.). Included in the indictment was the charge of also murdering Ann Nailor’s sister Mary aged about eight. Despite support for the daughter from character witnesses, both were condemned to hang at Tyburn on 19th July 1762. Gruesomely the mother became insensible and suffered fits on the night before the execution but nevertheless was taken to the gallows and hanged in that state. The daughter attempted to ‘plead her belly’, having been told this would earn her a reprieve, but was examined by a group of ‘matrons’ appointed for the task and found not to be pregnant. She later denied that she had ever had ‘criminal conversation’ with any man although it was widely assumed at the time that she was Richard Rooker’s mistress. Richard Rooker died in 1763 leaving his estate to his sisters and to the twin children of widowed Anne Thompson, who I initially assumed was another Rooker sister . And there the story might have ended, until in the National Archives I came across a request made in May 1774 for letters of administration from the three Rooker sisters. In 1772, with their fellow executor Charles Blackwell, they had obtained control of the East India Bonds that had been left to the twins Ann Elrington Thompson and James Elrington Thompson, born on the 18th May 1759, who were now dead. By May 1774 Blackwell, a Holborn druggist, had gone bankrupt and was no longer a fit person to administer the bonds. The petition requested control be given to the Rooker sisters. It also revealed that the twins were Bastards of Rd. Rooker deceased. In a further twist, I noticed that there was an Ann Thompson who gave evidence at the trial in favour of Sarah Morgan Metyard – was she the same Ann Thompson who was the mother of Richard Rooker’s twins? And Richard himself? Berrow’s Worcester Journal for Thursday, February 10th, 1763 reported that On Thursday Mr. Rooker was found dead in a Lane near his House at Ealing, dismembered, and his Throat cut in a shocking Manner. This unfortunate Man formerly kept a Grocer’s Shop at the Corner of Water Lane, Fleet Street; and he appeared as an Evidence on the Trial of Sarah Morgan Metyard, who was executed with her Mother, for the barbarous Murder of an Apprentice Girl some Time ago. At the inquest the following day it was revealed that Richard Rooker had not been himself for some time. On Friday last the Coroner’s Inquest sat on the Body of Mr. Rooker, who was found dead by the Side of a Ditch the preceding Day on Ealing Common, and brought in their Verdict Lunacy; it appeared on Examination, that he had been disordered in his Mind for some Time past, and once attempted to cut the Jack-Line, that the Weight might fall upon his Head; the Morning of the Day when he murdered himself, he went to his Washer Woman for some clean Linnen, and told her it was the last Time she would wash for him; and then getting himself shaved, told the Barber it would be the last Time; he first dismembered himself, and then cut his Throat, but had not Strength enough to cut the Wind Pipe, however the great Effusion of Blood put an End to his Life. How much his state of mind had been affected by the Metyard case we will never know. Frances Rooker’s son William Philp Perrin died in 1820 without having married or ever visited the Jamaican estates on which his huge fortune was based. After the death of their mother the whole residue of the estate went to his sister Sarah who had married Sir William Fitzherbert of Tissington in 1777. 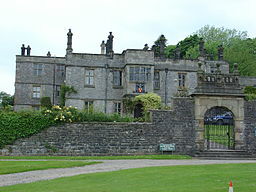 Tissington Hall is still lived in today by the Fitzherbert family. Both Lydia and Jane Rooker left their estates to their niece Lydia Rothery, and she also inherited £2,500 from her cousin William Philp Perrin in 1820. In 1787 Lydia married Thomas Bunnett and in 1842 Thomas Bunnett of Hanworth, mentions in his Will a bureau and bookcase that had belonged to the late Mr Perrin. And in answer to the question I started with – how did Lydia Rooker come to have a fortune of three thousand pounds? Almost certainly it was her inheritance from her father Richard Rooker the clockmaker, but until I can find details of his death and his Will this must remain a supposition. dealer in books book/paper/printing trades(s) Gentleman’s Magazine, March, 1756. Will proved 8 Feb 1763, PCC Prob 11/884.